When I was a child, my Mother encouraged my little sister and I (in a mandatory way) to keep a diary of our summer holidays. This was exciting at first, a trip to the stationery store to buy a book, pencils and best of all, Stickers. 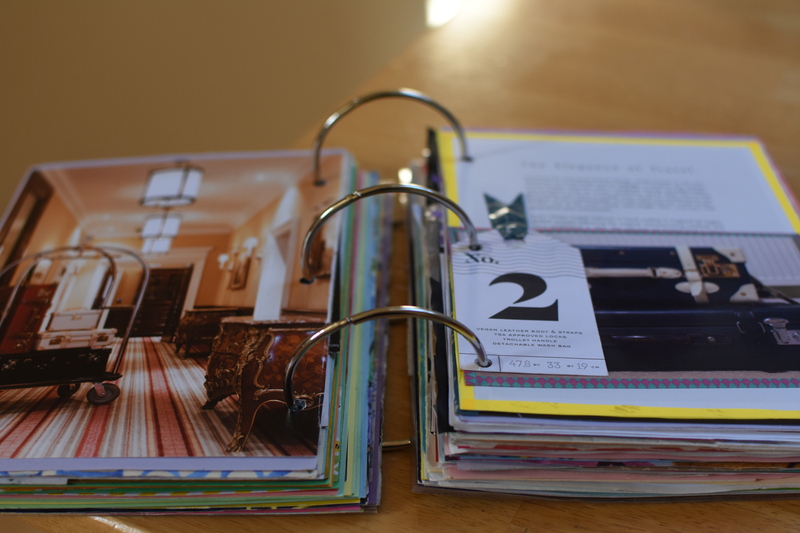 As the holidays went on however, I struggled to find the right balance in keeping the diary. I felt compelled to note every single detail of my day from the minute I woke up through to having dinner and going to bed. I felt horrible if I forgot anything I had done or missed any detail from the day. It was stressful. Looking back at my diaries reminds me of the pressure I felt each day and the reason why I stopped writing. This blog is good for helping me to overcome this fear and perfectionism. A few years ago I discovered the art of scrapbooking. In the UK it’s not a particularly popular hobby, more thought of as a child’s activity. 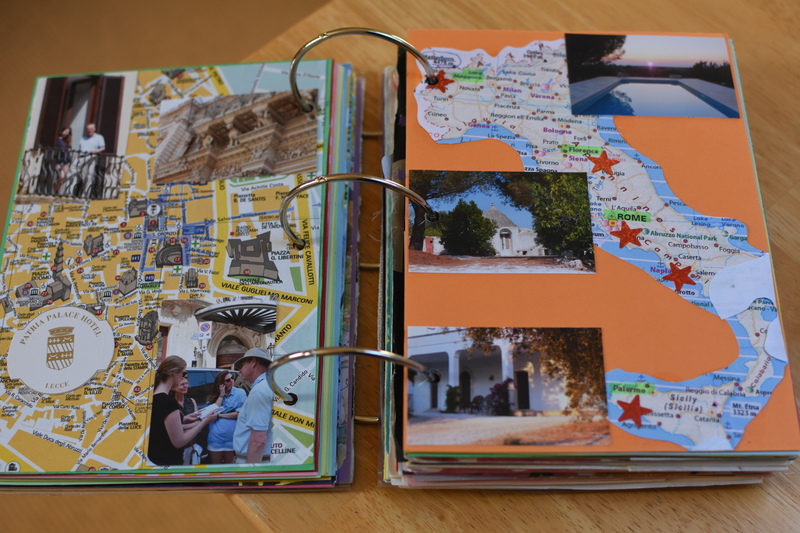 In North America (my summers were spent in Toronto, Canada) there is a huge world of scrapbooking and creators who spend their time paper crafting and journalling with memorabilia and photographs. I have always been one for collecting things; tickets, cards, scribbled notes I wrote to myself. Whether on a school trip or holiday or even an exciting day trip, I’ve felt the need to keep the collected memorabilia. I’ve spent many a day on holiday combing beaches for interesting shells to keep. I think this is one reason why I like taking photographs, keeping memories to look back on in the future. I’ve been an aspiring scrapbooker for a long time but just didn’t know how to go about making a book. In 2014 I came up with a practical way to collate all of my cherished keep sakes (a very unorganised and daunting collection of papers). I started with a spiral bound A5 book of coloured paper from Paperchase, but quickly this became too bulky with bits and bobs stuck to all the pages. The paper was too thin and also the coloured pages are in a set order and aren’t changeable. The solution to this was to use loos binder rings and make my own book from individual pages. With these I could rearrange the layout as many times as I wanted and add or remove things from the book too. 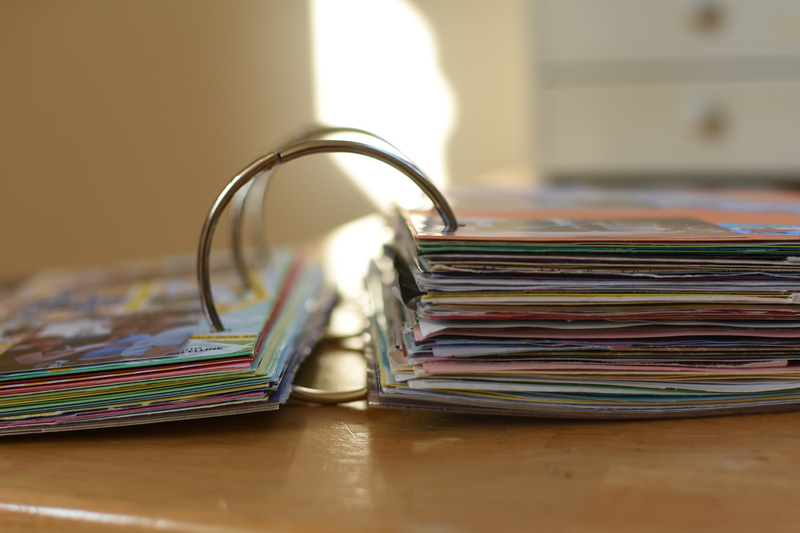 I used coloured card, paper, and cut outs I’d saved from magazines and card books. 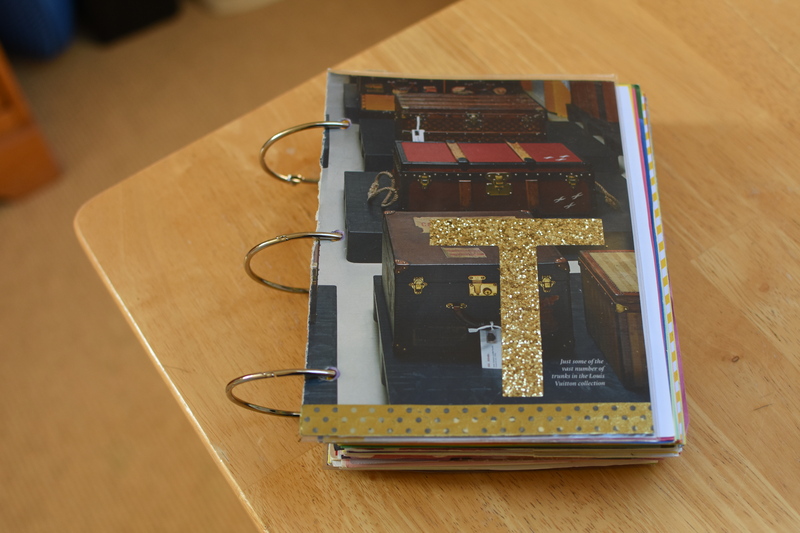 Now my book is an amazing 3 loos ring book of my own papers and cards. I had so many things I wanted to include and my aim for the finished product kept changing. Again, I felt the pressure of what I ought to keep, building in my mind. 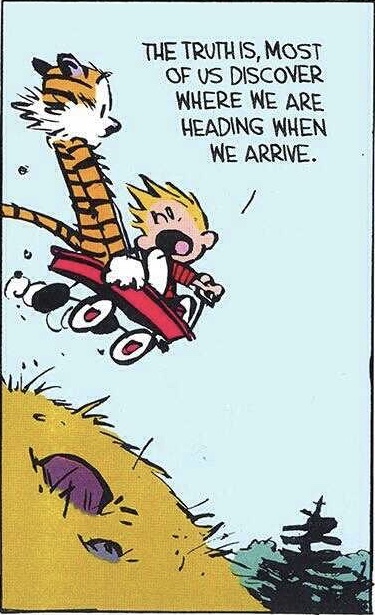 The worry of forgetting a detail. I have a few times sat down and gone through all my bits and pieces and culled anything that isn’t of sentimental importance and that I’ve only kept because I felt it was a record that must be saved and not something that I actually cared about. 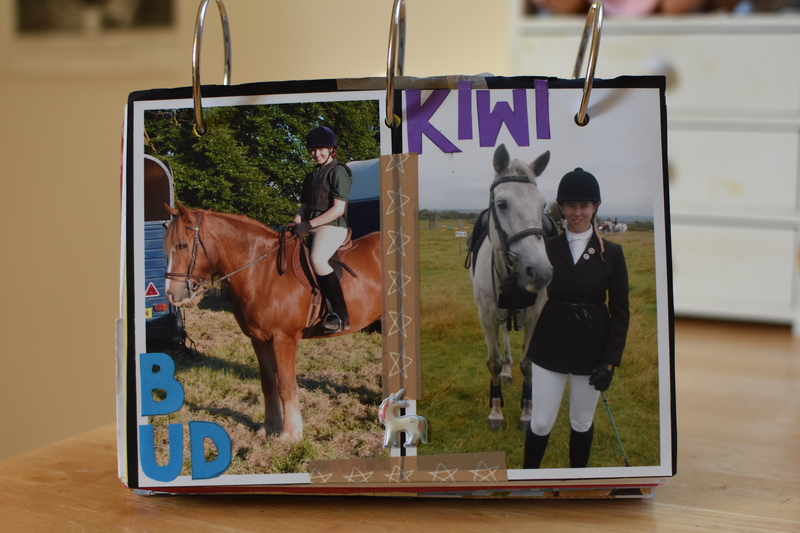 I’m very proud of my scrapbook now, and apart from a few photos of previous holidays I want to put in, it’s finished. 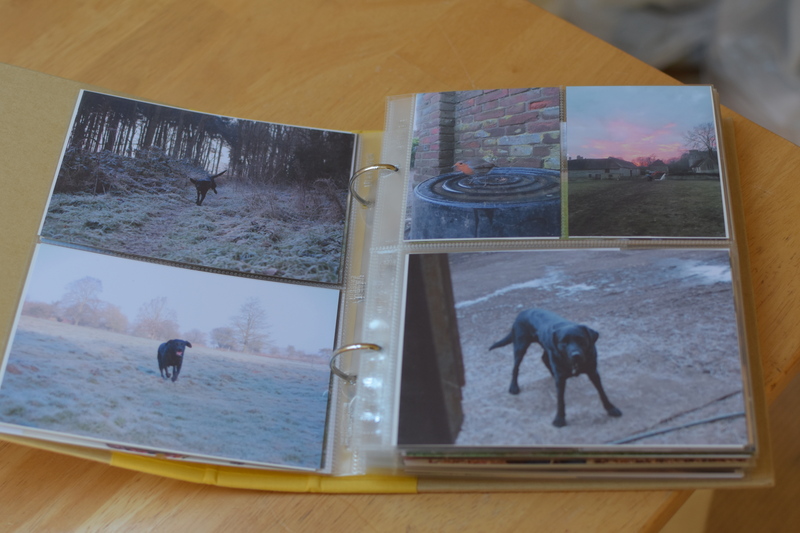 The book is a collection of all my previous savings, from holidays, school, friends, hobbies, notes I’ve kept, all sorts of things. It sums up me, in memories from my childhood. This book is everything I have saved from over the years. It’s a chunky book but I like that. In 2017 I found out about Project Life on Pinterest. 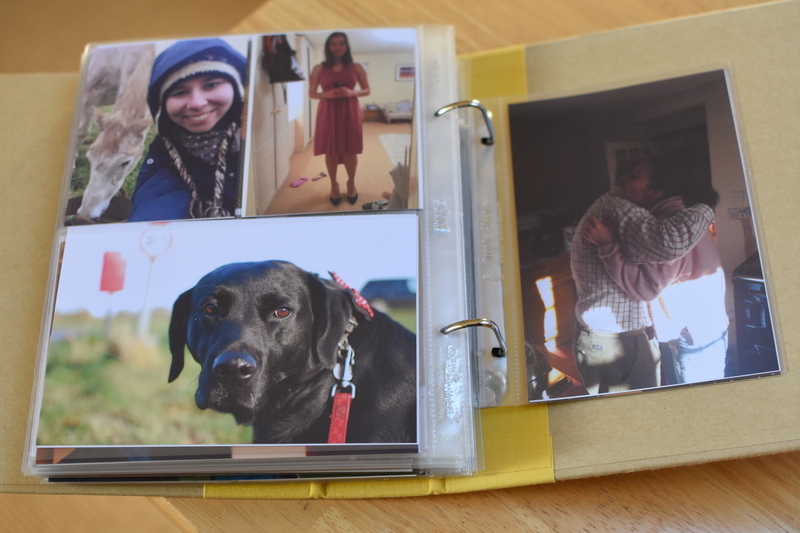 I love the idea of curating memories in this format and I got stuck into learning about it on youtube. 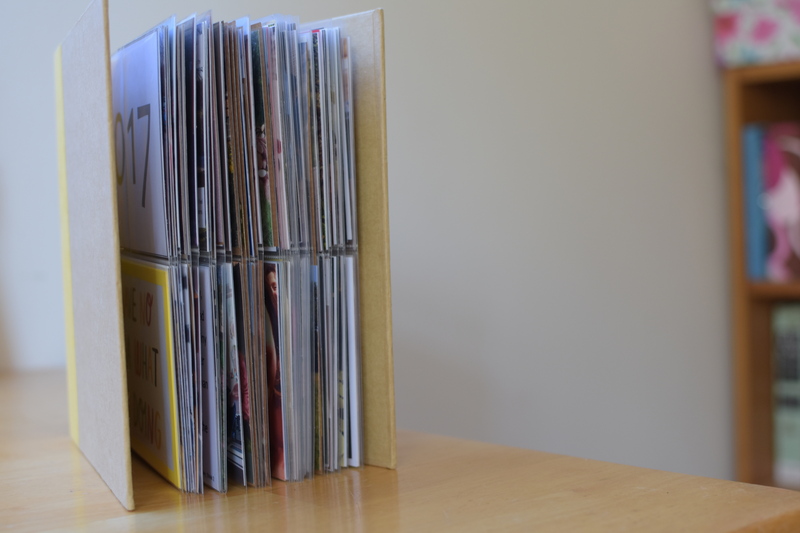 I bought a Simple Stories 6×8 ring-binder with a yellow fabric banner and a few yellow pages included. The book is designed to hold plastic pocket pages. 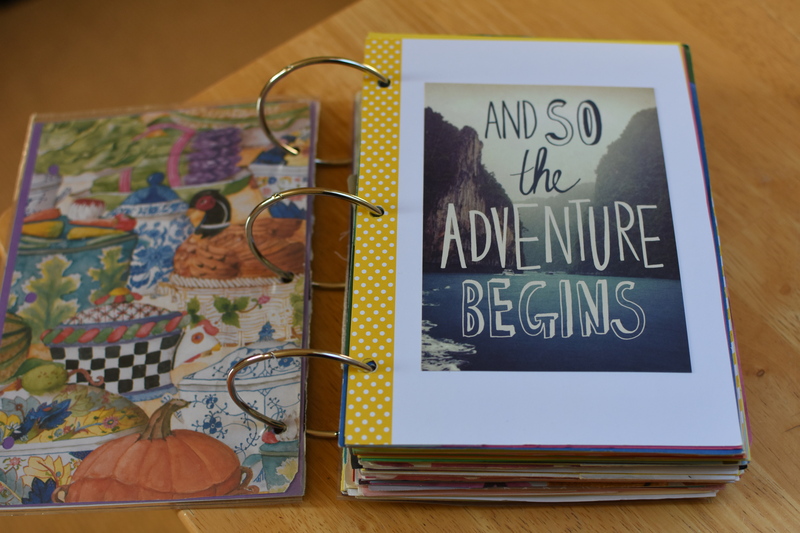 My pages are from Simples Stories as well as Becky Higgins own range of Project Life pockets. I bought 6×8 whole page pockets, 2 4×6 pocket pages, 4 3×4 pocket pages and also smaller pages of 2 3×4 pockets and 1 4×6 pocket. My 2017 Project Life is primarily photos telling the story of my year. 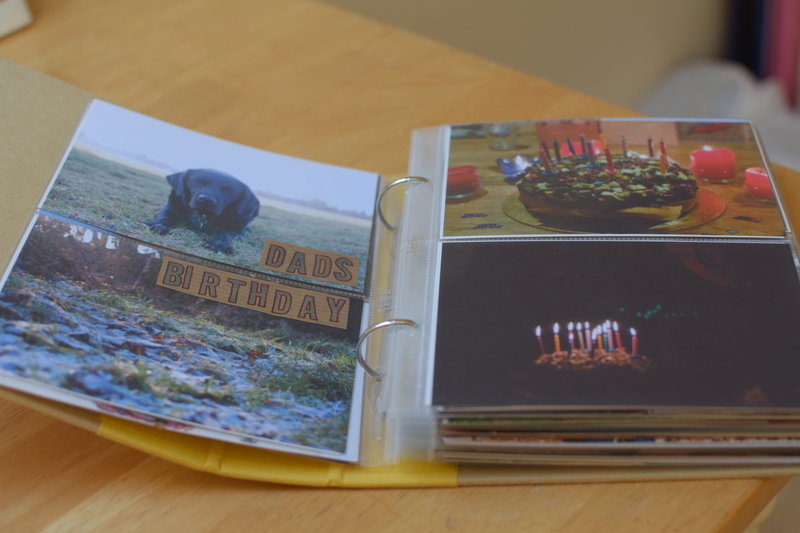 With occasional cards or tickets and notes stuck onto the photos. I wanted to use one binder for the whole year so I kept documenting to a minimal. Photography is one of my passions so I had plenty of photos to choose from for each event I wanted to record. I used stamps and sharpie fine liner pens to annotate on photos with dates and descriptions. I also used the app Snapseed on my phone to add comments to a few photos before I printed them. 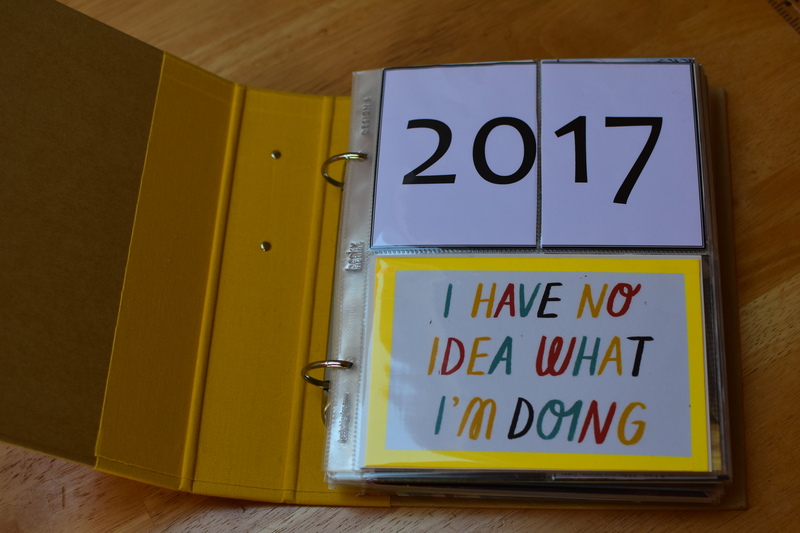 Both my original scrapbook and my 2017 Project Life book have very personal memories saved and I’ve really enjoyed putting them together. I’m definitely going to carry on consolidating my odds and ends like this and for my next book I’m going to use my Pinterest board for inspiration “Things that make me smile” and I’ll see where that idea takes me. How much to save. How much do I need to remember? e.g. Do I need the exact time and details of each trip I’ve taken? What if I can’t remember them? I’m getting better at stopping and thinking about what I actually WANT to keep. The details that made me smile, jokes that were told, people who were there and the atmosphere of the event. I don’t need to record the time of a ferry crossing, the exact details of a cosy day inside or every meal I ate out whilst on holiday. How to start… I am a natural perfectionist and on countless occasions this has held me back from experimenting and being creative for fear of doing it wrong. I’m trying to overcome this by sometimes walking away from my project, putting it aside and doing something different. Then again, it’s also good to make a plan or layout and then part way through decide to change it and do it completely differently. It helps me feel better to know that the act of creating is not about immediately producing a masterpiece. This is important when looking online for inspiration on Pinterest. As with all online media, it’s easy to fall into the trap of believing that other people produce beautiful things and that my creations will never be as good. Theodore Roosevelt said “Comparison is the thief of joy”. My goal is to look at my projects as being entirely me. Me being as much me as possible! 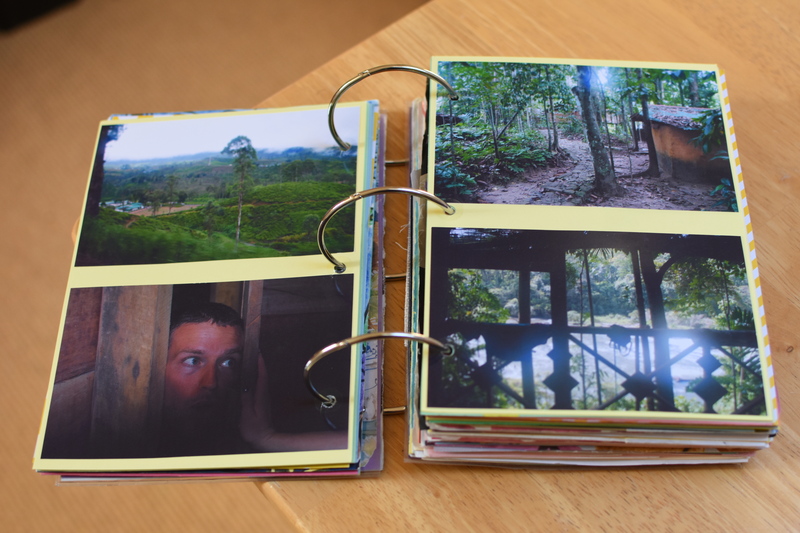 My scrapbooks develop as they do and I may end up with something entirely different from the idea I started out with.